I remember the rhetorical emphasis of my father recounting the memory of his professor at Dhaka University asking that question. For everyone knew what happens is that which always happened to those ‗names.‘ Runner—one could say, their generic name–still delivers the message. The message of honey and money:, translated for Coliuddin, Soliuddin and Rohiuddin, into truckloads of the fragrant dead. And the honey and money never touch him. Just like the economy has no face, no nose. No visible hands. But those who locked them in knew well the faces of those who burned. They were just playing their roles, passing on the message. The hot end of the supply chain reacts like an animal on crack, screams SweatshopNation, then slowly the news gets more and more lucid… the letters in the bottle come back, washed up on the shore of the New York Times. The names are read out loud, somewhere on the other end. The sea‘s hooves…the foam coughs up the incidental messengers. O rainJam…what can happen here, this land beneath water, what am I doing…what can we do. Zainul Abedin, you hang like a Matisse in some men’s houses. ‘You must come, there won‘t be many of us this time,‘ Saydia insisted. Her insistence was much like I would have imagined a certain road to be, the road of Sirat al-Mustaqim — simple, intent, undetournable. water. As he saves himself, me and the entire filthy, dripping system, I look out of my red and gold palki‘ (for he packs me in so demure, aloft, hovering in a glistening immunity) at the thirteen-year- old boy pushing his cart of weekend waste with such muscular exertion waist-high in water, like something out of a Zainul Abedin painting. A friend had told me, on the token underpass near Karwan Bazaar: ‘Workers had broken Abedin paintings in one of those wildcat protests.‘ They just went inside the buildings, wrecked all in their path, the many, the few. ‘Marx couldn‘t have imagined how many layers/divisions …capitalism would create.‘ Bonna Mirza, the actual actress, standing against the wall leftstage of the pathological ‗scene‘at court, responds thus to me calling the ‗locking in‘ of workers during a fire a ‗supervisory‘ norm in our factories, as vicious a norm as the eternally bailed owner. She was implying that present capitalism encompassed not only the coordinating and managerial class, but the sub-sub managerial class , just a rung higher than what I call the dry Shorbohara. The wet Shorbohara come from river-erosion, are often rickshawallas. Though not always. The dry ones sometimes come from the north, like many of the workers in Tazreen. Or from some other unknown desh with in the desh, countries of man-made drought, slow starvation. The court is frozen in time, in that moment in Passage to India, where the peons prepare the two seats of the judges, dust the thrones, open the shutters for air or lights. Classic colonial—I say. With deshi fusion, she says. Our serial is 30, whispers Saydia. She has been here many more times than four. She wears her patience like gathering infamy…I remember, she told the reporters, We have to dismantle the system…Then what are we doing here? Do we give up right now. The moment comes and goes, the window of perhaps-justice. We are not as dismayed as last time, the judges speak of ‗stern action‘ against an inspector of police for infinitely delaying their submission of the compensation list (which thus cannot be matched with the petitioners‘ own list). At least, Hossein is not smiling, like last time. Even the tall, bald man, his bodyguard or the DG, seems tense. Yet, Barua mentions ‘criminal negligence‘ so softly, one can‘t be even slightly appeased. I can‘t help wonder back to the screaming ‘Faschi Chai‘ of Shahbagh that I watched on TV for four months…I know Amra Bachte Chai, Shonghoti, others…would have shouted, outside, if they thought it would avail something…But their fragmented purposes and confidences, and ours, have splintered the same cause, specialized the labour of ‘revolt‘—or, that word as vague as love, justice. Epiphany. But Delwar Hossain is praying. He‘s been praying since the day he had to first arrive in court, with intervals of course, of sending his goons to harass workers. Hamid, who walks around with the folder of his dead wife carrying their child. Child, that was Sumaiya, when she first arrived in Tazreen. Seven years of her youth she gave to an invisible hand: Tazreen‘s, Delwar‘s, GDP‘s, Wall-mart? She tied Saydia and Sabuj‘s hands to her bed recently, Saydia says, not wanting to be alone. They had stood by her, as alone as anyone in this labyrinth who doesn‘t have some bodyguard or gatekeeper to remember you are ‘human‘ like they say, in the declaration of human rights, or a ‘citizen‘ like in the constitution, or, God‘s best invention, in the holy book. And now the Radical Surgery we can offer her is as ephemeral as Compensation Lists and Probe Report Verdicts, Sumaiya, who can‘t see with one eye, whose blunt head injury is like a carving in Mount Rushmore in my Return to Oz dreams…where the evil which Moomba has rows of heads in glass boxes. And where the ‗powders of life‘ are an elixir we seek, sometimes in Dhaka Medical College, sometimes in front of BGMEA, sometimes in a long march, and even more rarely, preciously, on the road to Court 21. When Tazreen first burned, the immediate reaction was, among the usual suspects in pre-Porjonmo Chottor Shahbagh, that things must fall apart. That we too, in our usual forms and habitual protest rituals, must come apart. Uneasy murmurs, muffled horror, grey eyed black-outs of conscience trying to see the present/the future, ran through the crowd. We must go Now to BGMEA. No, straight to Shongshod Vobon! Then What? Protocol was kept. More gatherings took place, Nishchintapure Nribiganni was created, the seven month gathering of data of the missing, the dead and the injured took place. Protests. A litigation that, if it came to pass, would be historic. ‘WE let them go in 1991.’ There has been no precedent for criminal negligence or culpable homicide. Rana did not set the precedent, yet. Meanwhile, Shahbagh. Enough has been said. I lost a few friends, though gained most back. The ‘revolution‘ was not stalled when Shahbagh lost its ‗innocence‘. It was never begun, after Tazreen. ideological, epileptic fit of revolutionary or radical ‘intentions‘ and urges, organizing and failure, progress and circularity. Taslima Aktar‘s fatal photograph photographed us staring at ourselves, for that picture was a picture of the murderer‘s murder. The crime‘s crime. The gazer‘s self awareness: this is us—both killer and killed. We are ‗famous‘ in NYT now. International Press grace us with their gracious glimpses of truth, a flash of JustIce delayed, justice denied. The state probe report found Delwar guilty of criminal negligence, as well as seven others. But the bad fight never begun. Lagata Shonglap cholche, cholbe. Even the marches seem like words, sometimes. You say No, I say Go. You say Go, I say No. Identical, like the poles. What about violent revolutions? What does the cultural conscience say? We are not afraid of violence, here. No Gandhi to be heard lucidly in these lands: We appear to be quite comfortable with Faschi. But our experiments with truth are hidden somewhere in Kushtia, In Tangail where Bhashani‘s truck remains, in Chittagong‘s Buddhist archives containing Tibetan palms. The distance between conscience and change seems like a lifetime‘s engagement with ‗society‘—both one‘s enemy and one‘s comrades. Siraj Sikdar said the left must criticize itself: his theses are still hauntingly pertinent. Some of those conditions, geopolitical, economic, seemed to have stood still in time. But this is not a litany, this is not an ode: I am not an anthropologist activist, nor political dynamite. And I do not come to throw flowers in the graves of the resisting, however they think, imagine, know, feel they can. One cannot give up. One has no choice. Sumaiya does not know how to give up, though she has had to give up an eye, she did not learn. One can only get closer to the heart of the Entangled, nested relations that form the scaffolding and circuits of the collapsible building of power, between judiciary and legislative, labour law made by garments owner-politicians and press notes read quicker than a poor man‘s lawsuit by the evanescent international media. The court and vested interests—BGMEA, Delwar-dalals in power—have the weapon of exhaustion on their side. Industrialists have intimidation. The State has its police. But it is not the exhaust fumes of the NojusticeNoPeace train that is exhausting. It is not being able to gather the forces that are one step ahead of the three steps back, it is this perpetual joyride in the moon of hell‘s night sky. Astronauts in capes follow the dress code of the Law: the Norms of Supervisors dictates they ignore the ‘inflammable‘ nature of the body of their ‘inferiors‘; the norms of activism and the precariat dictate what? 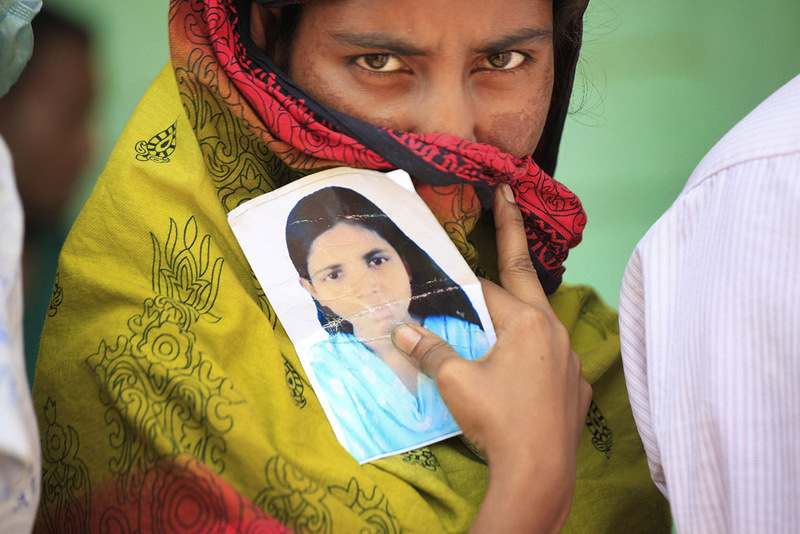 I watch Saydia and Nazreen Shifa and Sumon put up photos of empty holes where names should have been, for the missing. There would never have been an October revolution if we listened to the party, and we have no Lenin yet, anyway. And those days are gone. New Forms, says Nafeesa. Not occupy here, you saw what we occupied in ‘projnomo.‘ Did we even occupy our own cultural and historical space, much less the social? Shahbagh. Enough has been said. Those who spoke of diluting the issue today must know exactly how ‘issues’ are diluted: Tazreen a case in point. Fatal attractions to pro/anti-liberation and secularist/Islamist binaries are inextricable from ‘diluting’ the issue. But for now, the struggle is desperately calm. Like looking at a river die, like watching the still photo of a mother crying a thousand times, the captured image of her howl. A scream is a bullet—but filtered for us, between man and man, a scream is just an incidental messenger. To look at the labour law amendments, the reckoning will not be, it seems, one of conscience—we are not America in the 30s. The BGMEA, much like the state and many NGOs when they are pulled by the hair by donors to be good, responded with what appeared to be sincere attempts at reform; then swiftly revealed the propaganda. IV. State of our Awakening, 2013. Repugnance at suffering is not a virtue, Buddha said. His was the path of equanimity. Horror itself is mere material for rage. Rage itself cannot rise above its conditions, until the ‗visionary‘ description of change and the potential for that change somehow meet in the social ‗stage‘ that is usurped or that occurs, before its time. If we keep to the dress code, shall the judges grace us with a giant leap for mankind, a small leap out of the scaffolding of power and farce? Chittagong Airport, mid-May the same year. ‘They won‘t let us protest and it‘s all state media,‘ my sister‘s Cambodian student says, smiling the whole time, intent on return to her hometown, to practice what she has learned about ‗social movements‘ in her class with my sister at Asian University for Women. I had wanted to speak to the man, in spite of his gawking, to find out what a North African was doing in Chittagong. Not trading in the flesh, I had not even considered. For I had known North Africans and being a subjectivity that continually flows from stream of consciousness to stream of unconsciousness….I had thought back to the Tunisian stamp I had received in a letter from an American journalist and colleague at AUW: Revolution de la dignite, it said. With the face of the man for whom the revolution started. It is not the first time in history that people in ‗non violent‘ revolutions did violence unto themselves or were burned by their oppressors, to spark that Fire. The revolution, like much of the ‘Spring‘ and its aftermath, has been televised, going against the insight of the Seattle/Venezuela maxim: The revolution shall not be televised . After Tazreen, many horrors were televised, but the battles for dignity of the working classes has not been. We see them burn and collapse, we see fraternity, we see farce. But we do not see their rage as much as their despair, their moving towards the bullet as much as the non-breaking news of their token death in wildcat strikes. The media has done what it can. It is our turn, to acknowledge that ‘dismantling the system‘ begins with creating the social possibility of revolutionary protest, as well as protesting. The call for unity, for coming together, on May1rst was louder than the one after Tazreen. Yet, in spite of everyone‘s sincere intentions we couldn‘t quite overcome our fragmented alliances. Amra Bachte chai was there. The tireless usual suspects were there, who‘ve carried on the battle. But the numbers were not there. And the anarchists, the proletariat really, were barely there. So we go to them- we ask them, like doctors, how they are. They tell us, they begin to trust us. WE say we dislikeNGOs. They still think we are NGO. We say we are from this shonghoti or just ‗activists‘ and journalists. They trust quickly, having been let down a hundred times before. One among them, I heard the other day, saying, we can take it down, we want to take it down. That‘s the revolution of dignity. We don‘t want to help dig graves anymore. Not only will they pay, they will first be remanded by The Furies of a Mother tongue and Father Zakat: Justice, threshold, time. How come they divide us so well, but we cannot Divide them? Do we just pray for them to self-destruct??? There is an outrage so incisive, unrelenting in this country, that not even the rhetoric of an egalitarian society One Day, and certainly not the great narratives of nation, religious orthodoxy, modernism and secularism, can disguise the reality of our indifference to the only thing that matters: this child in the road is not a spoon…but appears to be one. Thereadymade answer of the left is not at all readymade anymore, it is an ever widening compass…each ounce of our intelligence, knowledge, energy…must ask the question again, from the point of view of an answer. where our cold-eyed Joan of Arc stands, outside Court 21.